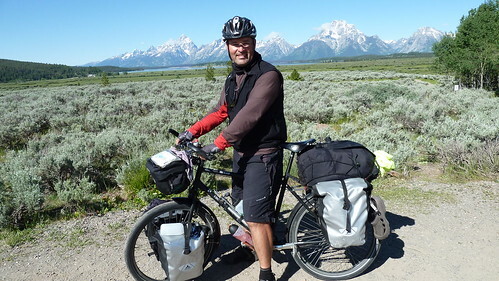 Between May and September of 2010 I set out to cycle from the east coast to the west coast of America. I ended up cycling 6000 miles in total and had some amazing adventures en-route. This Blog was written whilst on the road and records the trials and tribulations of my amazing journey. Use the Blog Archive links on the right to follow my journey. What an inspiration! Thank you for sharing this. I want to go cycling with my dad when he retires. He'll have more time to do this with us. During your journey, where's the best stopover you made? I was planning to stopover little restaurants we would come across, but maybe you can give us more ideas? Thank you! Hi Timothy, Glad you enjoyed my Blog. The maps provided by the ACA list a lot of Motels and camp sites on the route and I often asked advice from other cyclists I met. Sometimes there is very little choice as you are crossing wilderness areas and there is limited accommodation. I think you need to be prepared to camp a bit and combine this with motels too, it depends on your budget as well. But camping out under the stars in the rockies is hard to beat! Best of luck and hope you get to do the trip with your dad. Thanks so much! He saw the link, now he's even more excited. We might go cycling next week!